Tennessee’s start to the 2018-19 season has been one of the best starts in program history. And it’s caught the attention of the college basketball world. The Vols are currently No. 3 in the AP Poll and could be in line for another move up in the poll if they take care of business this upcoming Saturday against Alabama. No. 1 Duke fell at home to unranked Syracuse in overtime on Monday, leaving the top spot in the AP Poll up for grabs. With the way the Vols have been dominating opponents this season, many believe they should be the team to grab that No. 1 spot in the poll. Tennessee is 15-1 on the season and currently has an 11-game winning streak. That streak is tied for the fifth-longest winning streak in school history, and their 15-1 start is the second-best start in program history to a season since the Vols joined the SEC prior to the 1931 season. Not only have the Vols put together a long string of wins, but they’ve done so in extremely impressive fashion. The Vols’ victory over then-No. 1 Gonzaga came as the third win in their 11-game winning streak, and that 76-73 win is the closest game the Vols have played all season. Tennessee lost in overtime to Kansas by a score of 87-81, but every other game they’ve played hasn’t been all that close. Florida led for a large chunk of their recent game against the Vols, but Tennessee pulled away in the final minute to nab an 11-point victory. The Gators, just like almost every other team the Vols have played this season, saw how dominant Tennessee is when they turn it on. Of Tennessee’s 15 wins to start this season, 14 of them have come by 10 or more points. Of those 14 double-digit victories, nine of them have come by 19 points or more, including their 106-87 win over Arkansas on Tuesday night. The Vols’ impressive win over Arkansas was timely considering the recent loss by Duke. And it has people associated with the NCAA thinking that Tennessee will be a No. 1 seed come tournament time in March. Joe Boozell of NCAA.com wrote an article late Tuesday night about both Tennessee’s and Virginia’s impressive victories on Tuesday following Duke’s loss to Syracuse. He posed that both the Vols and Cavaliers are the two most balanced teams in college basketball, and both are headed for two of the top four seeds in the NCAA Tournament. The Cavaliers demolished a top-10 Virginia Tech squad on Tuesday, defeating the Hokies by a score of 81-59. Virginia is a little more defense-heavy than the Vols, but both Tennessee and Virginia have been thoroughly impressive to start this season. In fact, Boozell says both teams are “likely” to get No. 1 seeds in the NCAA Tournament. Right now, Joe Lunardi of ESPN has the Vols and Virginia as No. 1 seeds in his latest bracketology update. Tennessee is the top seed in the Midwest region while Virginia has the No. 1 seed in the East. Michigan and Duke have Lunardi’s other No. 1 seeds. Michigan and Virginia are the only two unbeaten teams left in college basketball. The rest of the teams in the recent top 10 of the AP Poll have lost at least once, and all but Tennessee have gotten scares from unranked teams. The only other one-loss teams in the top 10 of this week’s poll (Texas Tech, Nevada) have had much closer games than Tennessee. Nevada escaped Boise State with a one-point win on Tuesday night, and Texas Tech has beaten unranked West Virginia by three points, unranked Kansas State by six, and unranked Texas by six. Tennessee has been consistently overwhelming to opponents, as has Virginia. And that’s been the most impressive part. “It’s easy to get caught up in miraculous individual performances, big name programs and whatnot,” Boozell wrote. “That’s all fine. But consistency is hard to achieve in this sport, perhaps more than any other. And Virginia and Tennessee have done so thus far. 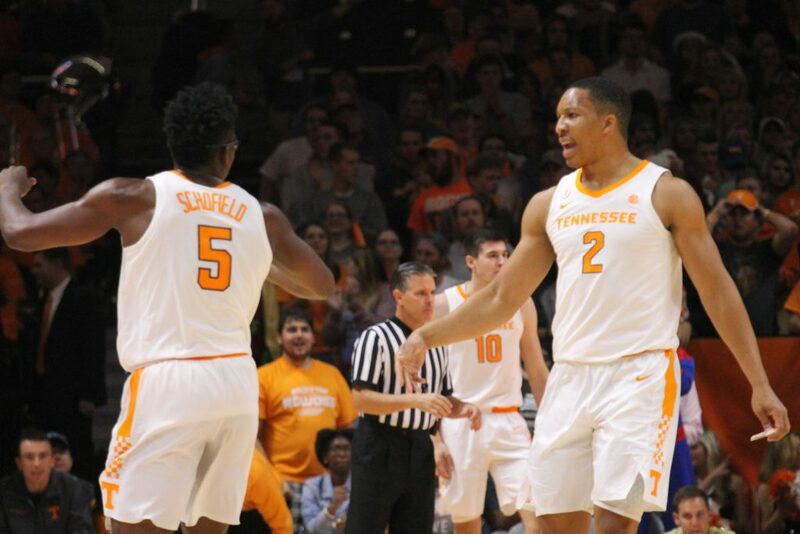 Boozell ends his piece by saying, “We can’t overstate how impressive Virginia and Tennessee have been in 2018-19.” And as it relates to Tennessee, the Vols haven’t had a more impressive start to a season in modern program history. The Vols have been ranked inside the top-5 of the AP Poll for eight of the 11 weeks the poll has been active this season. Even the 2007-08 team — the squad that briefly achieved the No. 1 ranking in the country — didn’t have that type of consistency, nor did they dominate opponents the way UT has this season. That team was in the top-5 of the AP Poll for seven of the 20 weeks of the basketball season, and they tied the 2000-01 team for the best start in school history with a 16-1 record. But in those first 17 games, they didn’t blow out as many opponents as this team has. That team barely edged out West Virginia by two points, had trouble with UTC and only beat them by six, beat Western Kentucky by only six points, and had three other single-digit victories. What Tennessee is doing this season is unheard of for UT’s men’s basketball program, and it’s impressing more than just Vol fans.